President and CEO, Five Star Building Corp.
As far as Kevin Perrier is concerned, Five Star Building Corp. is going to be a household name before long. And listening to the founder of the Easthampton-based construction company explain his trajectory, such lofty aspirations seem like a distinct possibility. Perrier started the business 10 years ago with a pickup truck and a whole lot of enthusiasm. Steady growth has been the pattern, and despite a soft economy, an ambitious goal of $10 million in sales has been set for this year, with high-profile jobs at UMass Amherst, Westfield State College, downtown Northampton, Amherst, and his hometown of Easthampton. Continued growth is his only goal, Perrier said, and when, not if, his company meets $200 million a year, he still won’t be satisfied. “Because I’ll want to be the company that does $300 million,” he said. 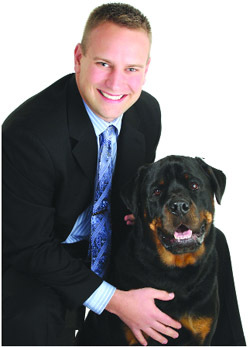 In addition to his success in business, Perrier is active with the Dakin Pioneer Valley Humane Society. Admitting to a soft spot for animals, he helped move the organization to its new home in Springfield, and started the Dakin Charity Golf Tournament, which has raised $45,000 in two years.